"Do it for the dress"
What a lot of ladies say while eating the 70th salad straight. In light of my recent wedding, I wanted to fill you in on the specific tweaks I made to lose 5 pounds in the weeks leading up to my wedding. And by tweaks I mean SMALL things that made a BIG difference. The best part? I didn't have to change my lifestyle much at all. Disclaimer: No crash diets or killer workouts were used in the making of this post. So, why exactly did I want to lose these couple pounds? Well, my dress was on the form fitting side and I was slightly heavier than when I initially got fitted for it ( poor planning on my part to get fitted right after coming off a post-surgery smoothie diet). Would the dress have fit? Yeah. Would I have been comfortable? Not completely. Ladies. Whether you're prepping for your own wedding, event, or just want to tighten things up a bit, let's make a pact to do it the right way. Right as in healthy. Healthy as in sustainable, even after the wedding bells have rang. Deal? I'm going to guess you can relate to something in this section. As humans, neither of us is above this. Hey we learn through experience, right? Extreme weight loss will never be worth the adverse effects on your body and relationship with food. I'm talking about fad diets, cutting out whole food groups (aka fat or carbs), working your body into the ground, or other harmful ways. All of these methods of losing weight quickly can make you not only gain it back, but potentially damage your relationship with food and exercise for the long-term. 1 pound equals 3500 calories. We must eat less, burn more, or both, in order to achieve this 3500 calorie deficit. Statistically, losing at a rate of 1-2 pounds per week is a good, healthy rate. While this all may be true in a controlled setting, it does come with some risks and flaws. Somewhere along the way, lines got twisted to say that the more calories we burn, or the less we eat, the better. When weight loss doesn't come as quick as we want, what's our first instinct? I know for me, it used to be eating much less, and beating myself up in the gym. We watch shows like Extreme Weight Loss or Biggest Loser and think that weight should just fall off. In some cases it works, but in many cases the weight is gained back because sustainable habits weren't formed. By restricting ourselves of food that nourishes our bodies or even the occasional treat, we train ourselves to want it more. When we re-introduce it back into our diet, it's easy to go overboard, thus fueling that unhealthy food relationship. As a sidenote, going TOO LOW on calories can really hurt your metabolic rate, causing your body to hold onto fat. Calculate your ideal calories here. What it's time to realize is that each of us loses weight in a unique way and pace. It's up to you to learn how your body works. Your best bet to lose a few pounds, feel good about it, and keep it off lies in your habits and behaviors. When I initially started prepping for my wedding weight loss I knew I didn't want to take drastic measures. I decided to make a few tiny tweaks that lead to a big difference. I'd been in maintenance mode for a while, focusing on strength and endurance rather than the scale. These seemingly small changes allowed me to clean up my act and drop 5 pounds in the month prior to my wedding. I've been through the crazy weight loss thing and have learned that I'm just not a nice person when I deprive myself of foods I enjoy. I wanted this time to be a comprehensive effort so that I could keep my cool in the weeks leading up to the wedding. Not the sexiest one to start with, I know ;) But this was HUGE for me. As someone that already lives a life on the go, wedding aside, I had to force myself to squeeze in more recovery time. This meant being patient with myself and listening to my body. If I only got 5-6 hours of sleep and I knew the next day was going to be slammed, I gave myself permission to sleep a little longer. There were countless workouts missed, but I knew that it was better than forcing myself through it on a lack of sleep. Plus, I wasn't relying solely on my workouts for weight loss so it took a little pressure off, which was amazing. Yo. This is a big one. Did you know that your body can actually hold onto fat when you're stressed out. Nerdy science moment - When you are stressed, the hormone cortisol increases in your body. Cortisol is a catabolic hormone, meaning it breaksdown. As a result of stress, the cortisol hormone breaks down muscles, which in turn lowers the rate at which you can burning calories at rest (aka metabolic rate). OK. Thanks for being patient. Does that make sense? I'm a chronic stress-er so it was important that I work on managing it. To manage my ever present stress, I started doing some really short deep breathing exercises. I would literally sit still, close my eyes, and focus on my breath once a day. I often set a timer on my phone for 5-8 minutes and would end up feeling SO good afterwards. You can practice deep breathing anywhere too, even at work! I also focused on cleaning up what I was putting in my mouth. Nutrition is a huge area to tackle, but I didn't strive for perfection. I planned my meals weekly so I was cooking 90% of the time. I aimed to eat meals that were slightly lower in carbohydrates, rather than completely getting rid of them (they're kinda important, ya know ;)). Shoutout to my new bff's: zoodles and cauliflower rice. I aimed to make my plate as colorful as possible so it was full of nutrient-rich veggies! Those are pretty simple rules right? I still managed to eat out once or twice on the weekends, enjoy dessert, and go to social gatherings without feeling guilty. It's all about tiny tweaks ya'll. No calorie counting, no restriction, no crazy diets. 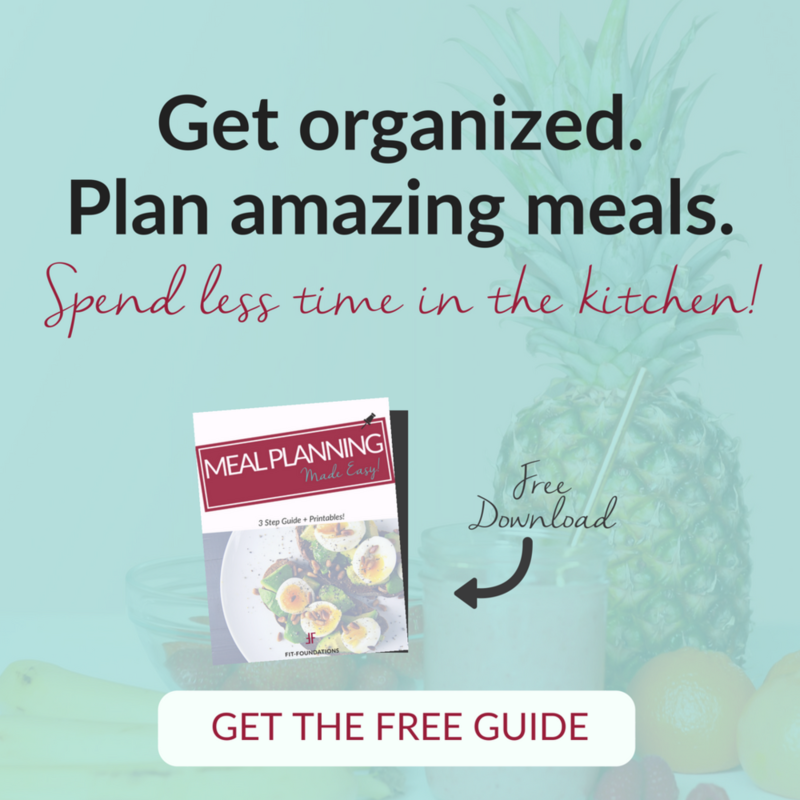 Resource: Meal Planning Made Easy Guide - for actionable strategies and printable lists! Ah finally, my favorite! This is the fun part. I created an 8 week plan for myself which I quasi-followed, depending on the week. I scheduled myself 2 days of strictly strength and circuit training, 2 days of cardio (usually running, spinning, or stair climbing) and 1 day of yoga/mobility training. The beauty is that there's no right or wrong way to workout. Don't overthink it when it comes to fitness. 3-5 good workouts per week will get the job done. You can either wing it, or get a plan specific to you and your goals. (P.S. I'd be happy to work with you on this). If you're looking to tone your muscles while losing fat, you'll ultimately want to combine some form of strength training with cardio. The best way to do this would be with circuit training: 8-10 exercises done back to back without much rest (do 2-3 rounds). I post tons of workouts on my facebook page and instagram (@fit.foundations). Check em out. Here is a free home workout program you can download right now! Taking a comprehensive approach with a focus on recovery, stress, nutrition, and fitness allows you the freedom to just make tiny tweaks in each area, rather than going extreme in one. It also leads to a greater chance of you forming solid habits you will sustain for the long-term. Once you reach your goal, you can ultimately continue practicing these habits while you maintain. Tell me about your weight loss journey. Have you tried extreme routes (like me) before? Have you been successful in any of the tactics we talked about today?